There is no better way of spending your free time than boating and grilling on your pontoon boat. If you own a pontoon boat, you can do both of these activities simultaneously. For you to be able to take your mouthwatering meals to the open waters, you will need to buy one of the best pontoon boat grills the market has to offer. 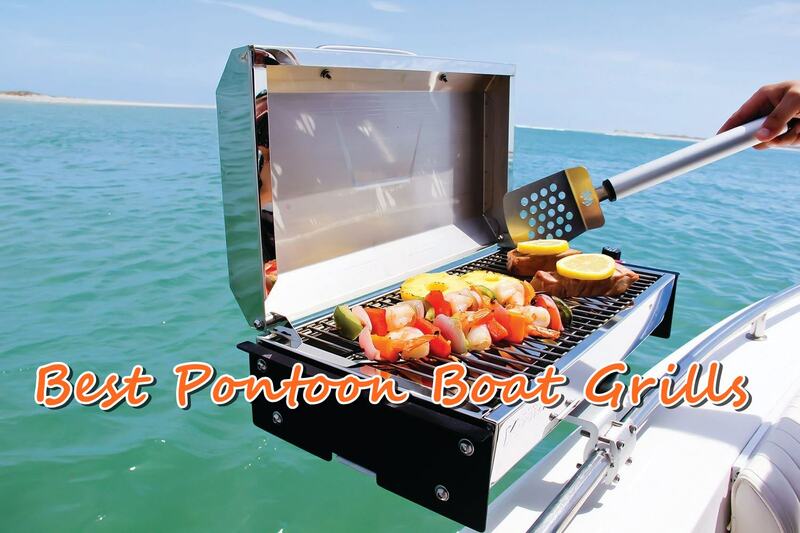 There are many pontoon boat grills on today’s market. Each of them come with unique construction, grilling features, and price. All you have to do is find the perfect model that meets your requirements. Based on our findings, we have reviewed five best products the market has to offer in 2018 for your selection. In addition, we have highlighted the most important buying tips in case you have limited knowledge of pontoon boat grills. This is the ultimate onboard grilling solution for boaters. You can use the Stow N’ Go 160 on deck or you can attach it to the railing by using a mounting kit that is sold separately. Apart from rail mounting, this unit does not need any assemble. You can have it up and ready for cooking just a few moments after unboxing. It is engineered from high quality stainless steel, which is highly durable and rust resistant. It uses refillable canisters or disposable fuel bottles. It is fitted with a removable grease tray, which makes it easy to use. There is also an air adjustment that you can make on the grill so as to optimize performance. The Cuisinart Grill combines an Arnall’s bracket system with a modified Cuisinart barbeque grill. This allows it to be mounted easily and removed when needed. 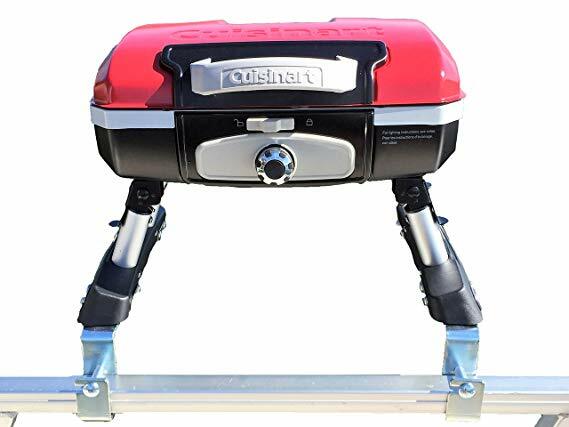 This unit not only comes with a mount that allows it to be mounted to the rail, but it also comes with a solid rear mount for locking on to the propane canister used by the grill. It will not mark or scratch your railing. It comes with a larger cooking area, easy carry handle, locking lid, drip tray, and a stainless steel burner. 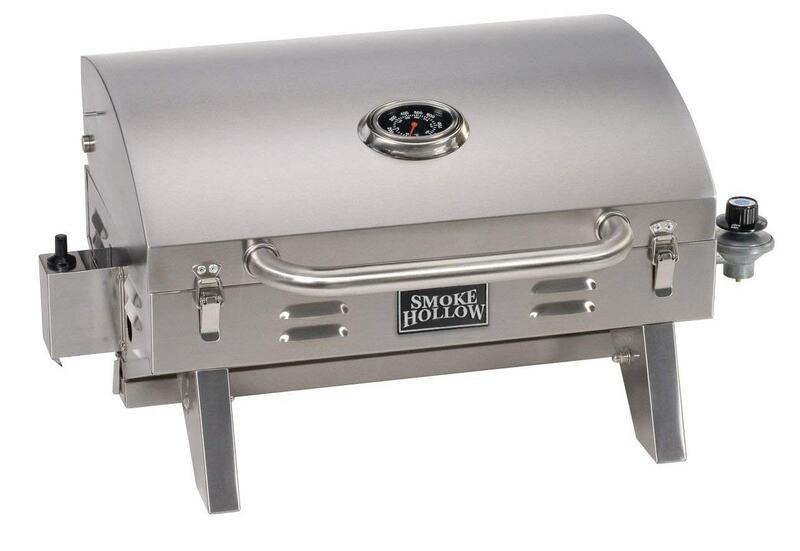 It is also integrated with its own ignition system, which does an amazing job of grilling. This model is great for anyone who loves to barbeque on the open water, and would also make a great gift for any boating fans. The Magma Product A10-918-2GS is made from a hundred percent 18-9 marine grade polished stainless steel material, which can withstand harsh conditions and high heating temperatures. This is definitely a grill that is designed for ultimate boating experience. Weighing roughly 20 pounds and with four fold away legs, you can easily move it from dry land and into the boat. It only takes a few minutes to set up the unit for easy grilling, and it is fitted with a lock-in grease tray that makes cleaning remarkably easy. You will never have to worry about installing the propane tank thanks to the swiveling regulator/control valve that allows for safer and quick canister exchange. The unit can also be used with onboard natural gas or low pressure propane fuel systems. It is equipped with a dynamic combustion that stays lit even in windy conditions. You never have to worry about carrying a lighter, because it is installed with a reliable electronic ignition system. This is not only a fine working pontoon boat grill, but it is also a stylish one. It is engineered from a hundred percent mirror polished 18-9 stainless steel, which means it has a long life and it is rust resistant. The Magma Marine Kettle is available in the original size 15 inch or 17 inch, and it comes with new features that are both user-friendly and resourceful. Its steadiness in stiff breeze condition is due to its virtual blow-out proof turbo venturi and valve system. What you will also like is the new waterproof electronic pulse ignition system for consistent lighting every time you turn the grill on. 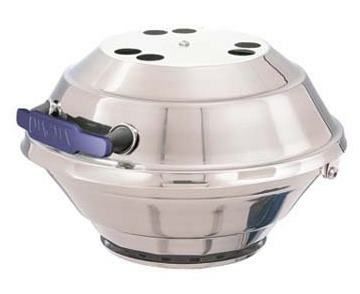 The control valve uses a standard one pound propane gas canister, which is sold separately. You can buy a natural gas converter kit to use natural gas. You can also hook up the valve to your onboard propane system. The Smoke Hollow 205 is incredibly versatile and truly pleasure to use. Its engineering is great providing you with outstanding results every time. It grills quickly and evenly. It is made of durable stainless steel construction that will withstand harsh outdoor conditions. Not to mention that it is highly rust resistant. It runs on a disposable, small, one pound propane canister that is not included. With an adapter and a propane gas hose, you can convert to a twenty pound propane bottle. Being capable to grill your favorite foods on your pontoon boat is a delightful experience. Selecting the ideal grill depends mostly on your personal preference. However, the most crucial factor to consider is the size of the grill. You want a model that will fit suitably on your pontoon boat, and still large enough to allow you to cook enough food for the people onboard. 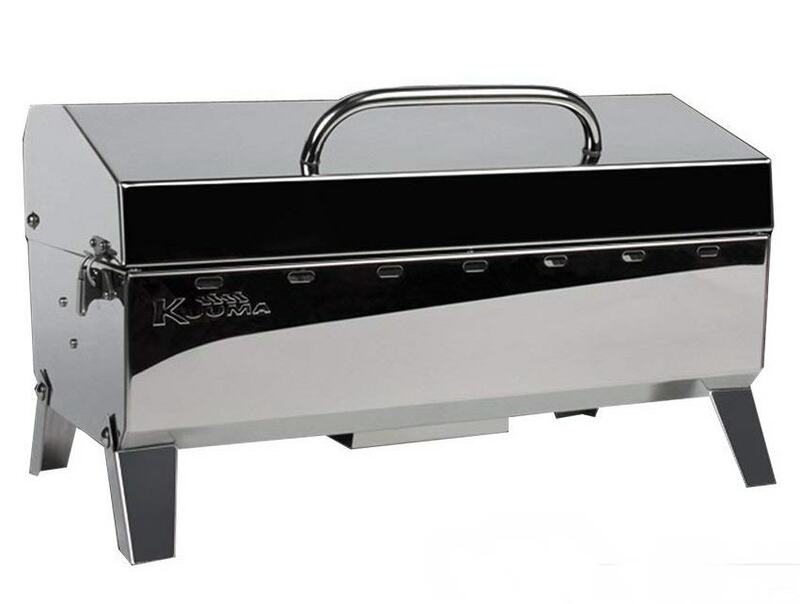 There are many portable grills that can be used on a pontoon boat. There are some that you can use on a tabletop while there are others that can be mounted on the boat railing. Of the two types, mounted grills are more resourceful and stable. With that said, let’s go through important features that you should look for. One of the first things you should find out is how much grilling area you want, size wise. At first, people tend to think of size in terms of how much food they want to cook. But that should not be the case. For a pontoon boat, you need a grill that will not consume too much space, but large enough, to meet your cooking needs. You need a model that can provide a grilling surface area of about 100 square inches or more. The shape you choose matters a lot, and the most popular shapes are circular and rectangular. If you are planning to cook for a slightly large number of people onboard, then you should settle for a rectangular grill. Circular pontoon boat grills are mostly resourceful for a few number of people and best for a single person. As far as portability is concerned, a circular grill is the better choice. Such a model is lighter and easy to carry into the boat. The pros and cons on each of these form factors is frankly a matter of personal preference. A lot of sailors seem to like the circular model because it stores very compactly and it clamps on to your stand rail with just a single mount. There are two popular fuel choices for pontoon boat grills: charcoal and gas. Charcoal is the classic choice, simply because it is easy to use compared to a gas model. A charcoal grill provides a true barbeque taste to any grilled meal. Charcoal grills come with very simple designs, making them remarkably affordable as well as very reliable. A charcoal grill is very much capable of generating very high hotness, which is essential for searing meat. However, a charcoal grill will take longer to reach the high temperatures, and the heat may not be evenly distributed across the grilling surface. The next downside of a charcoal pontoon boat grill is higher long-term fuel cost. You do also have a lot of cleaning to do. Liquid propane pontoon boat grills are the most popular choices. They are remarkably easy to use and require less cleanup when compared to charcoal grills. They get hot really fast without having to utilize a lot of fuel. They come with a number of options, which you cannot find on charcoal grills. You can easily adapt your pontoon boat propane grill to work with natural gas. A light, portable canister means a lighter, portable grill. Environmentally friendly propane contains no lead, creates low greenhouse gas emissions, and produces only water vapor and carbon dioxide. However, propane creates a wet heat that may sometimes change the texture of the food being cooked. Propane can be slightly more explosive than natural gas because it is heavier than air and stays concentrated for longer periods. So, you may want to be careful when using a propane grill on your pontoon boat. The thicker the walls, the more durable the grill, and the greater its ability to retain heat and moisture. Lift the grate and look under the hood. Do the walls of the firebox look sturdy and well-made? Usually, grill grates are made of either plain steel, porcelain coated steel, stainless steel, porcelain coated cast iron, or cast iron. The intense heat can easily wear down the grate if it is made of poor quality or thin material. Therefore, you need to take your time when choosing the grate material so as to ensure the taste of your food will never change. Steel grates are usually cheap, but with repeated use they tend to lose their temper and start to create chips. Stainless steel grates are also likely to lose their non-stick properties and end up creating chips. Cast iron or porcelain coated steel grates are good options, but the coating may end up chipping away, leading to rusty surface with time. Typically, cheap porcelain coated grates are most likely to produce chippings. Overall, you should choose a grill with a heavy cast iron grate. 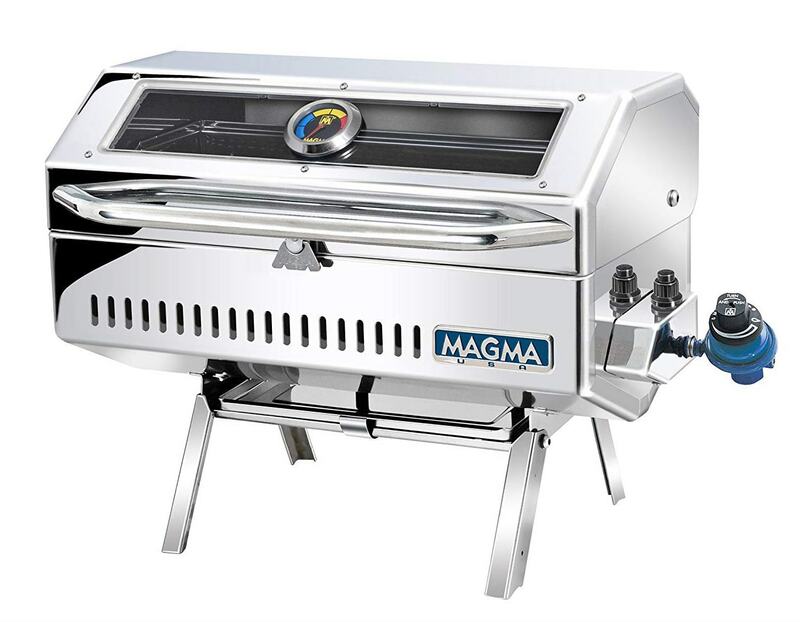 This option produces the best grilled food and offers long-term durability. Alternatively, you can decisively settle for a top-quality porcelain coated cast iron grate. You should understand that when buying one of the best pontoon boat grills, you are making an investment. Therefore, expect to spend accordingly in order to get yourself a grill that will provide tasty grilled meals and unmatched durability. All the aforementioned options are the best the market has to offer according to our findings. However, the best overall choice depends on your very specific requirements and personal preference. So, choose wisely.